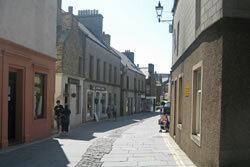 Stromness is one of two main towns on the Orkney Mainland and has much to offer the visitor. 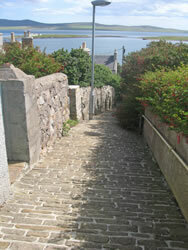 By far the most distinctive town in the Orkney Islands, Stromness is hemmed in by the hill of Brinkies Brae and the sea. 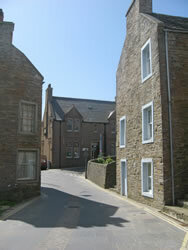 The houses of Stromness spill out over the waterfront with their gable ends to the sea. There are also many jetties, private piers, closes and alleyways to explore. 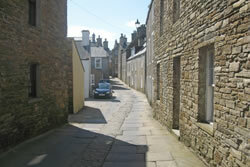 Stromness dates from the 17th Century and has a rich history of poets, artists, whalers, pirates, witches and wars. When war broke out between the British and the French sailors found passing Orkney was a much safer way to get around the British Islands than travelling through the English Channel. 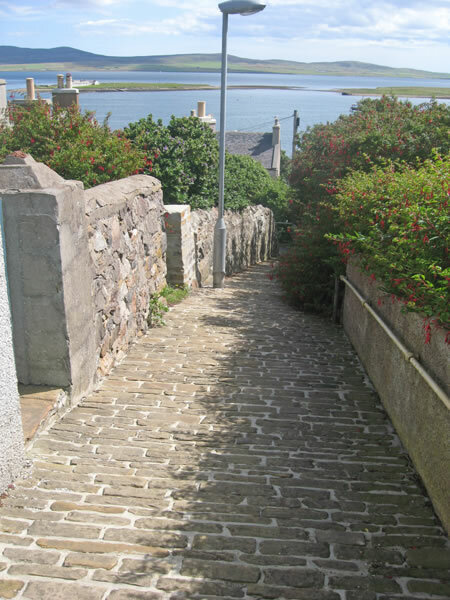 It was at this time that Stromness flourished! These days there are approximately 2,000 residents. There is a museum to explore, a world-famous art gallery; The Pier Arts Centre, and a well stocked library too. The winding flagstone main street has many shops to visit, from craft shops to search for unique gifts, to butchers and bakeries offering delicious local produce. There is a great night life to be found in the town, with lively pubs, folk music sessions, and several festivals per year. The Hotels, bars and restaurants all within 10 minute walk. 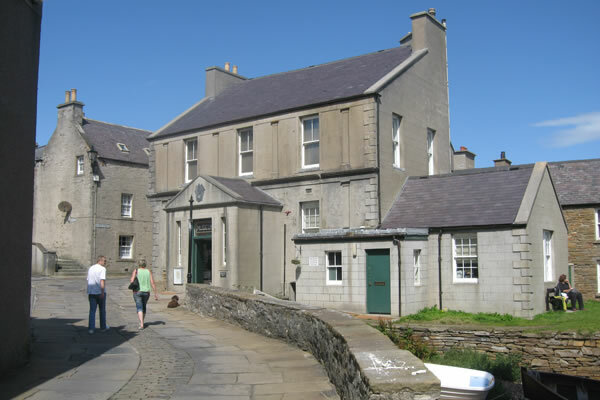 Stromness also has a swimming pool, fitness suite and jacuzzi which are very close at hand. And directly across the road we have the squash court and Orkney Fudge Factory – you choose which of these you'd prefer to visit! At the far end of the town there is a challenging but scenic Golf Course, right next to the sea. Try a round of midnight golf in the midsummer, when the sun doesn't set! 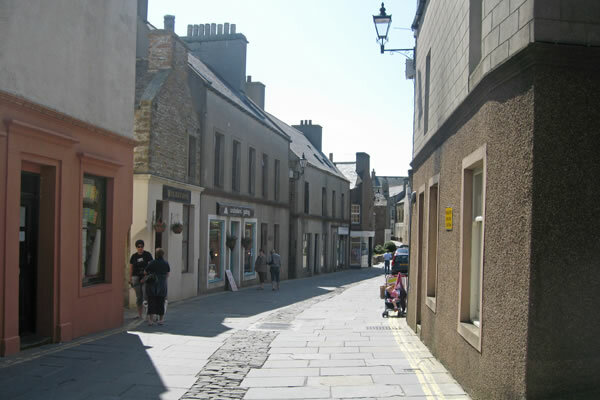 Stromness is also an ideal gateway to sites of interest – it is close to the Neolithic Village of Skara Brae, The Ring of Brodgar – the famous stone circle and Maeshowe – a chambered tomb with amazing runic inscriptions. If you’re feeling adventurous, the ferry to the island of Hoy departs from Stromness and offers a great day out where you can take in the sites of Hoy including the famous sea stack, the Old Man of Hoy, the Dwarfie Stane (a rock cut tomb) and the beautiful beach of Rackwick. Asgard Bed and Breakfast is located very close to the ferry which travels from Stromness to Scrabster. You can see a map of where we are located on our Getting Here page. The house lies East-West, so we have the full benefit of the sunrises and beautiful views of the hills of Hoy from the breakfast table and the sitting room. From the rear of the house there is a beach (pebble) walk worth taking as it runs parallel to the town and gives a great view of the waterfront and harbour. Asgard is the third house on the right. Check-in is between 5pm and 10pm. You can check-in at other times by arrangement. "A heavenly experience, many thanks"
"I had an amazing time! Thank you!!" To make a booking or to ask a question, please use the contact form or information below!